Leading off today: Tupper Lake has called off its Week 3 football game and may have difficulty finishing out the season, The Daily Times reported. 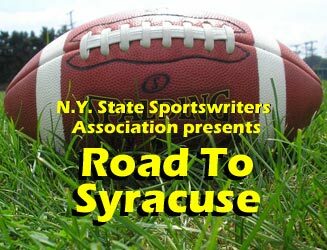 Citing injuries, the Red Raiders (0-2) notified Massena AD Gavin Regan on Tuesday that the annual Hall of Fame Game on Saturday could be canceled. Tupper Lake, off to an 0-2 start, began the season with 22 players but began this week with just 14 or 15 available to practice. The state minimum for a game is 16 players. Lumberjacks coach Dennis Klossner said the injuries include three players with concussions. "Not having a (junior varsity) program, we have nobody to pull from. We don't play again until (next) Saturday against Potsdam. We will know by Tuesday about that game. I don't want to keep everybody in the dark waiting until Thursday to see if we have a team." There is a possibility the Tupper Lake-Massena game could be rescheduled for the final week of the regular season. • Spectrum Cable telecasts and streaming schedule. Injury update: Spencerport's game against Brockport was supposed to feature two of the more exciting running backs in Upstate New York. Instead, both apparently will be sidelined by injuries. Spencerport senior Alton Jones is still recovering from a foot injury suffered against Canandaigua last week. Rangers coach John Dowd said Jones has not practiced all week but expects to be cleared to resume work Monday. Meanwhile, Cory Gross is still waiting to learn when he'll be able to make his season debut. Gross, who has commitmented to the University at Buffalo, injured his left knee during a preseason scrimmage. His father told the Democrat and Chronicle the results of an MRI this week will help determine his status. College commitment: Guard Earlette Scott, who helped South Shore to the Federation girls Class AA basketball title last March, committed to Providence College this week. Scott was seventh-team all-state as a junior. Her only official visit was to Providence this month, but Scott was also being recruited by a number of schools including Seton Hall and Albany. the "traditionally white" sports of lacrosse and field hockey. The students say the district provides fewer resources to teams from lower-income or predom- inantly black schools. Other allegations include schedules that deny them games against predominantly white schools. Student Nadirah McCrae said she sued after the district failed to file proper paperwork with the University of Hartford, which lead to her losing a scholarship. • The New Jersey State Interscholastic Athletic Association is staying in-house in filling the pending vacancy in its leadership position. Larry White, 64, was approved as the new executive director and will replace Steve Timko on Jan. 1. White has been an assistant director for the last 12 years. In speaking to reporters after being selected, White conceded something more than a few observers have assumed about the state's scholastic sports scene. "I don't think most coaches understand the rules; I don't think there are a lot of athletic directors that totally understand our rules and that's something we have to enforce," he said. "I think right now, that's where we get a lot of calls and anonymous contact about." More online: I blogged earlier today, leading off with several soccer items and a reminder about a big cross country meet.